The entire November ballot is in today’s Daily Sentinel, and it takes up 6 pages of fine print, like these two. Ballots were mailed today in Mesa County, and it’s a long one. 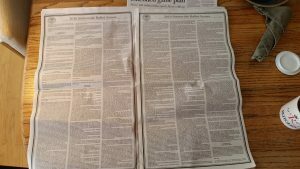 The Daily Sentinel has published the entire November ballot in today’s paper, and it takes up six full pages of the paper, in fine print. If you are worried about all the time it’s going to take to figure out how to vote on all this stuff, worry no more. We’ve done the research for you! We’ve looked into where the big money and corporate influence are coming from on all the issues, and how wealthy corporations are using ballot initiatives to try to trick you out of your rights, and weaken your influence and your ability to protect yourself and your families from their activities. We’ve looked at the ins and outs of all the issues, what’s fair and what’s not, and figured out how people can cast votes in their own interest. Just go to AnneLandmanBlog Voter Guide 2016 to see the recommended votes on the local, state and federal candidates and ballot issues. The rationale for the votes is toward the bottom of the post. Happy voting, and remember, after this you can mute all those annoying election TV ads! Trust me, I know what’s best vote who and what I tell you. Hmm, sounds as if big brother has invaded your blog.